Description: First time sailors Buford, sixty-two years old, and Jerry Beach, fifty-four years old, took on the incredible challenge of building the sixty-foot trimaran, which they named Beachouse, and then leaving Galveston, Texas, to sail the oceans of the world. With the philosophy of "you have to get off the boat and go inland to meet the people," the Beaches describe, through letters and journals, life among the inhabitants of Kanton, a remote Pacific Island. They write of meeting South Pacific island chiefs and of listening to a well-known revolutionary for Vanuatu independence sing "Deep in the Heart of Texas." Visit the miraculous time between the iron curtain and the rise of ethnic tensions when traveling around the world was safe and fun, except for rounding the Cape of Good Hope through hurricane force winds! 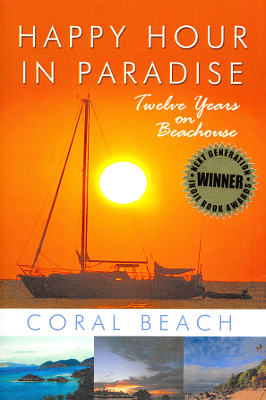 Written for non-sailors, Jerry's letters depict daily life on Beachouse, the gathering and happy hour place for cruisers, as well as the constant hard work of keeping the boat repaired, washing clothes by foot in a bucket, and the hunt for food and supplies in remote places. 318 pages. Viewed: 2,725 times since January 11, 2013.